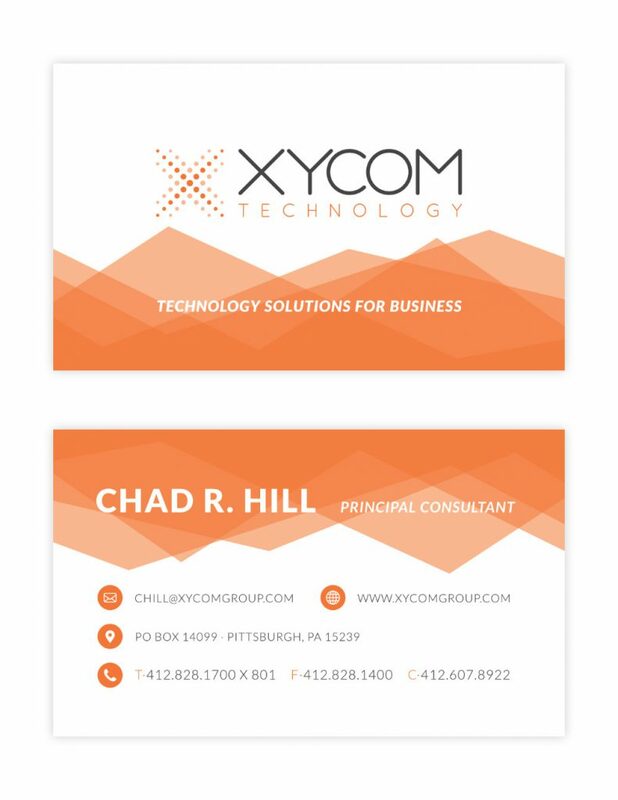 XYCOM Technology is a Pittsburgh, PA based company that provides commercial and residential technology services, such as network cabling, security system installation, and sound system installation. 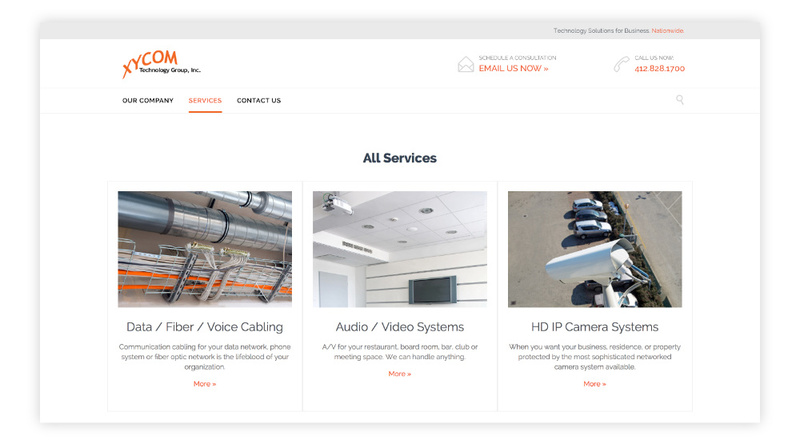 I worked with the company to completely redesign their dated website and logo into a modern, high-end looking service. 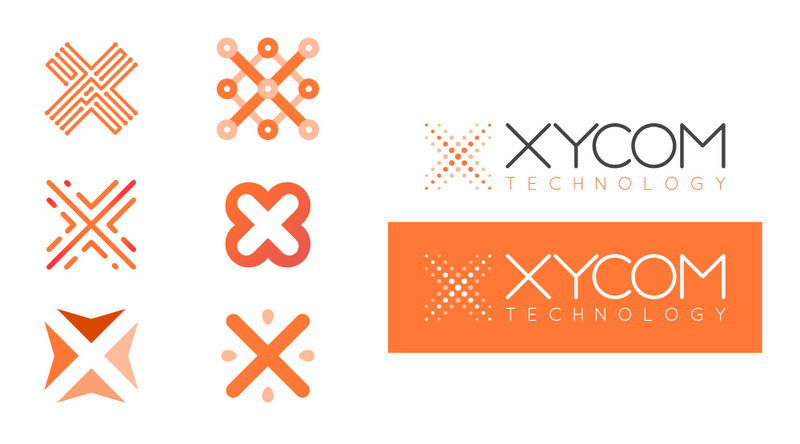 The original XYCOM logo was very outdated and didn’t provide a lot of sense about what the company offered. It was text based and utilized simple text art techniques that have become unappealing in the world of design. The client wanted the new logo to stick with the same colors they’re company was built on, but I had a wide range of creative freedom for designing the new brand. The new logo was designed to not only look more modern, but to also incorporate an icon that could be used to quickly recognize the company. The client expressed not wanting any sort of imagery because their service range is so broad. They wanted to appear modern, high-end, and technologically advanced. I decided to work with an abstract icon using the letter X from they company’s name. The initial inspiration for the icon was to have it resemble a circuit board. From there, I worked I worked through many ideas for designing the X icon, but settled on the simplistic dot grid style. This style fit all of the client’s criteria for the new brand and looked great as the face of a technology company. In the end, the client was very happy with the outcome of the new logo and how it made the company look modern and professional. The old XYCOM website was built on a basic WordPress theme that worked well, but didn’t portray the same modern, technological image the new logo gave to the company. For this part of the project, I designed a fully custom WordPress theme for XYCOM that better complimented the new logo. Above: XYCOM’s original website home page. The custom theme would include a unique header with an illustrative edge, modern photography, as well as custom graphic elements I crafted just for the brand. Since the company works with a range of technological services – including web development – I wanted to incorporate something tech related. The illustrative edge of the header was inspired by analytics graphs used to track website traffic and interaction. I also created some custom icons for the top-level service types to be displayed on the home page. These icons are meant to illustrate the services they represent and draw users in to this area of the home page. Once they see the top-level services, they can decide what category their needs fit into and explore further into the site to find the information they need. To round off incorporating the new brand into the company, I created a new set of business cards for the client. The cards boasted the new XYCOM logo, a modern font and layout, as well as some of the graphic elements from the new website. Now when the client attends networking events or client meetings, they have everything they need to promote their new brand and impress their customers. 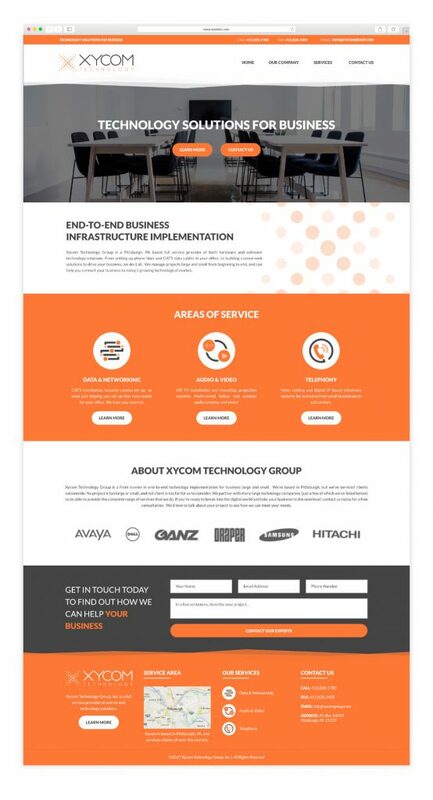 The new website is easy to use, professional, and ready to drive more customers to XYCOM Technology Group for their next business technology project.